Filed under gadgets on May 02, 2015. 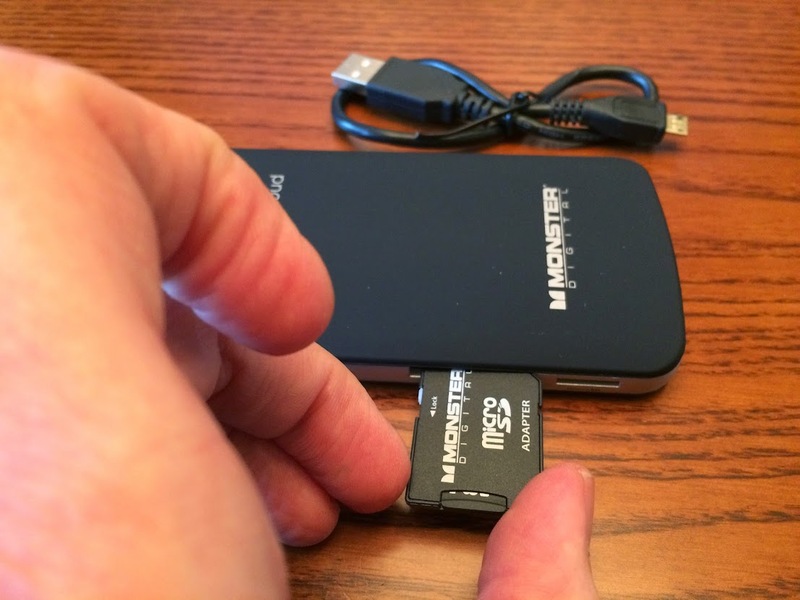 This post should be titled, Monster Digital OTG Cloud: Jack of all trades, master of none. Even the name of the device reveals a product that isn’t quite sure what it is. On-The-Go (OTG) Cloud? Would the average consumer get that? Before I begin with my thoughts on this device, take a look at the promotional video below for Monster’s own take on this device’s capabilities. Not only was is the OTG Cloud packed with features, Sam’s Club lowered the price from MSRP $99 to a rock bottom price of $14.15. If only one of the above features worked, this would be a valuable addition to my gadget bag. I do not know the exact reason for Sam’s Club markdown, but I suspect this is a product that didn’t sell. Amazon’s price for the OTG Cloud is around $30. Amazon reviewers give this device 3 stars. At these discount prices, the device could be worth the cost if you are technologically savvy. Let’s find out. The USB cable is a standard grade cable. I haven’t encountered any issues with it. Hard to mess that one up. The 8Gb microSD with SD adapter is a nice addition. The SD may only come with the Sam’s package. I am not sure if this is included in other retail packaging. Instructions come on a single sheet. It will get you started, but do not look to it for operating details. Finally, you get the OTG Cloud device. The actual OTG Cloud is well built and I really like the indicator lights on the device. Monster airs on the side of more lights rather than fewer and each light serves a needed function. The battery light is “upscale.” It actually shifts through three separate colors to indicate charge level. 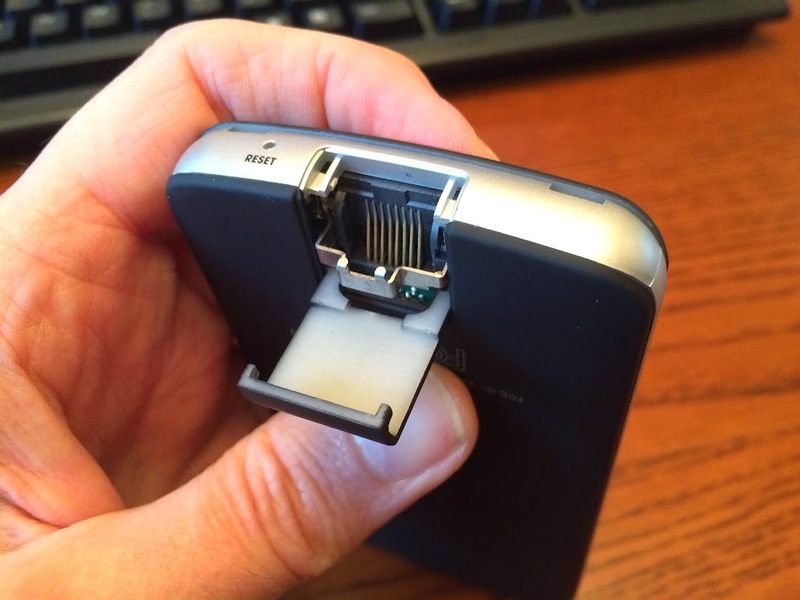 The 2000mAh battery is built in and not accessible for removal. The device is solid, feels good in the hand and has a modern industrial design. It has a slight rubberized coating to ensure it doesn’t slip from your hands. Even if it did slip from your hands, it would probably survive a fall from about 3’ or less. All ports are accessible as you would expect, except the for the Ethernet port. To keep the device slim, the Ethernet port expands from the device as shown in the image below. Flip open the port and the Ethernet port expands to accept a normal RJ-45 cable. It really is pretty slick and seems very solid. I don’t get the sense that over time this port will become damaged with regular use. All-in-all, the Cloud OTG sports some pretty nice hardware in a tiny package. 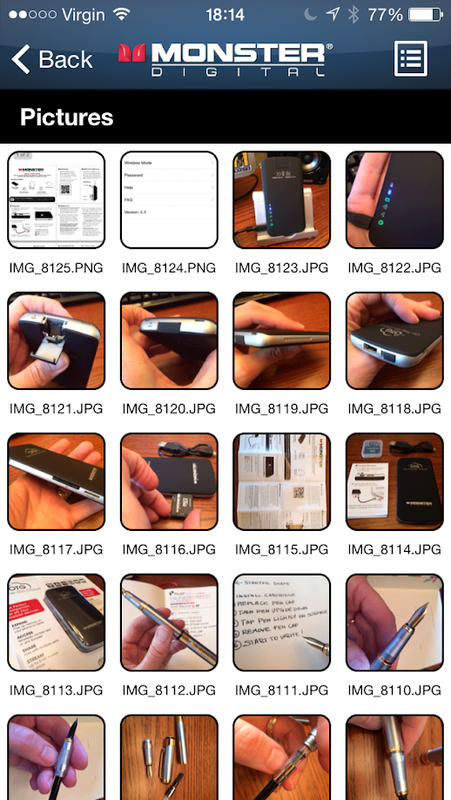 I was impressed with the quality and features of the hardware and had high hopes for the device usage. Sadly, the hardware will most likely be the last thing I rave about. Now that we have a feel for the hardware, let’s take a look at the software feature set. You can have the best hardware on the planet; however, if your have horrible firmware and software, the experience can be miserable. My first test was to access the included 8Gb microSD via a network connection. After plugging the microSD card into the adapter and then into the SD slot, I turned the device on. I followed the instructions to connect my Mac to the OTG Cloud via Wi-Fi. See the problem here? That’s right. If you connect to the OGT Cloud via your Mac’s Wi-Fi, you disconnect from your home Wi-Fi. No Internet connection! As a plain file server the OTG Cloud might come in useful to transfer files or watch video; however, to have online access, you have to disconnect from the OTG Cloud and then reconnect to your Wi-Fi router. There is a way around this, as we will see below, but the average user is not going to figure this out easily and will probably sit there and scratch their head. One the plus side, SD, microSD and USB ports operate as you expect. What I really like is that you can load all three at the same time. So you can have an 8Gb SD, 32Gb microSD and a 1Tb drive all connected to the device at the same time. They will appear as separate volumes. Hot plugging (installing and removing storage devices while the OTG Cloud is on) is also allowed, although I’m not so sure I would make this a regular practice. The OTG Cloud can also serve as a Wi-Fi router. I did not try to use this feature on my home network as I was not willing to replace my AirPort Extreme with this device under any circumstances and possibly mess up my home configuration. The next time I find myself in a hotel room with an Ethernet network connection, I’ll return to this post and provide an update. For now, let’s just assume it will work. Per the online help, it appears the device only supports WPA2 encryption and does not include any fancy fixin’s such as port forwarding, MAC address filtering, etc. It’s basic Wi-Fi router. I would never try to use this device as my main router and neither should you. Monster did not intend for you to use it this way. The OTG Cloud should be fine for limited use though and I actually look forward to the time when I can grab this device out of my travel bag and create a simple Wi-Fi network in a hotel. Using the device in extender mode will reduce Wi-Fi speeds to 50%. I was unable to watch video from a USB drive connected to the OTG Storage in this mode. It was choppy and buffered constantly. Interestingly, I was able to watch a YouTube video without issue. The device creates a new Wi-Fi SSID. So in effect, you create two separate networks. 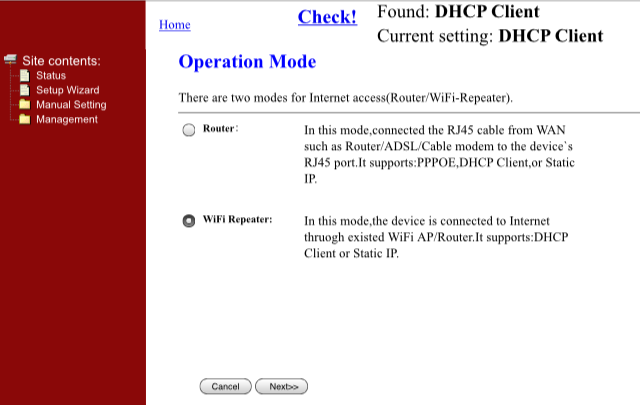 The OTG Cloud will not inherit the SSID from the host Wi-Fi router as an AirPort Express does. It is not a mesh whereby the extender becomes an extension of the network and utilizes the same IP address range. The OTG Cloud requests an IP address from the main router and then becomes its own DNS server: creating a whole new series of IP addresses. This setup is kludgy and very confusing. There is no way someone without some network experience is going to figure this out. Use a LAN scanner to determine which IP is assigned to the device. Once I connect, I then mount the storage attached to the device. This makes it a pretty handy file server. I keep the device in the front of my home and this provides a Wi-Fi network in my front yard. I had difficulty connecting in that location previously as our main Wi-Fi router was in the back of the home. I use this Wi-Fi extension when I return from a run and want to update my status on my iPhone or when I sit on the front porch with my iPad. Simply put, it works as a battery charger. It’s a 2000mAh battery so you will get about 1.5 charges for your iPhone. Probably won’t get a full charge for tablets; however, in a pinch, this thing could be useful. Just remember, when you drain the battery on the device, you will need to plug it in to recharge and use in other modes. Make sure and pack that USB cable with you and throw in a USB power brick. I actually think this is pretty smart. Why not have the battery available to charge other devices? I should mention that you can charge the battery two ways: using a USB power brick, not included, or by plugging the OTG Cloud via USB cable into your Mac’s USB port. 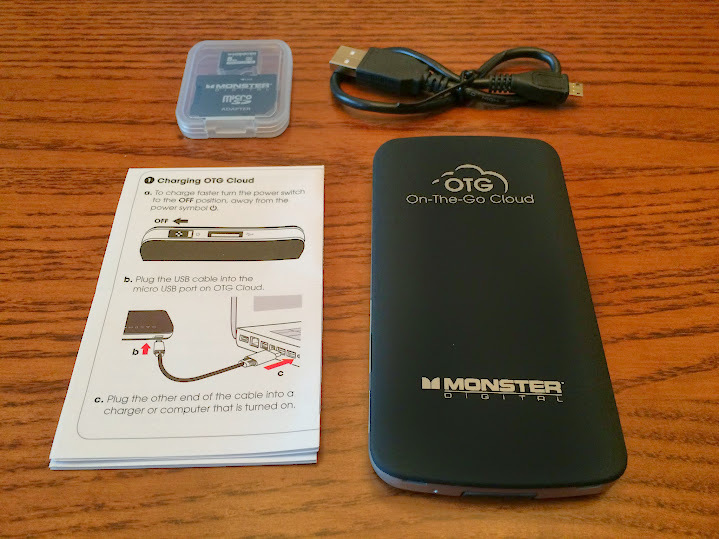 Keep the OTG cloud charged at all times and it could be a life saver on your next travels. Case - Monster should throw in a case for the OTG Cloud and the cable. USB power brick - you really need one to keep the device topped up or to use 24/7 while at home. Keeping it connected to your Mac means you have to keep the Mac turned on. Better firmware upgrade process - You perform upgrades manually. You identify the firmware version and then visit Monster’s support site to see if a newer version is available. If so, you download the firmware and then connect to the OTG Cloud. Next, you upload the firmware through the 1990s style web interface. Why is this not automated internally on the device? Kludgy! As of this writing, there have not been ANY firmware upgrades. Has Monster already abandoned this device? New web interface - You can use iOS software to manage the OTG Cloud; however, it is limited. For full control, use a web browser to connect to the OTG Cloud web interface. The UI is horrible and slow to respond. It also flickers as it refreshes pages. SD and microSD card reader - You cannot plug the device into your computer and mount the SD cards so files are accessible through Finder without a network connection. You must access files on the SD storage over the network. If we could mount the devices, this device could then serve as an SD and microSD card reader as well. One less device to throw into your travel bag. Better iOS software - The iOS software feels, operates and looks like a throwback to iOS 5 or 6. File access works, sometimes. I was constantly meet with a SMB! Error Trying to delete files on USB Drive error message when trying to, of course, delete files. I had to reboot the device to finally delete files. I found using a dedicated iOS network file browser app on iOS to be more reliable. I recommend FileBrowser. 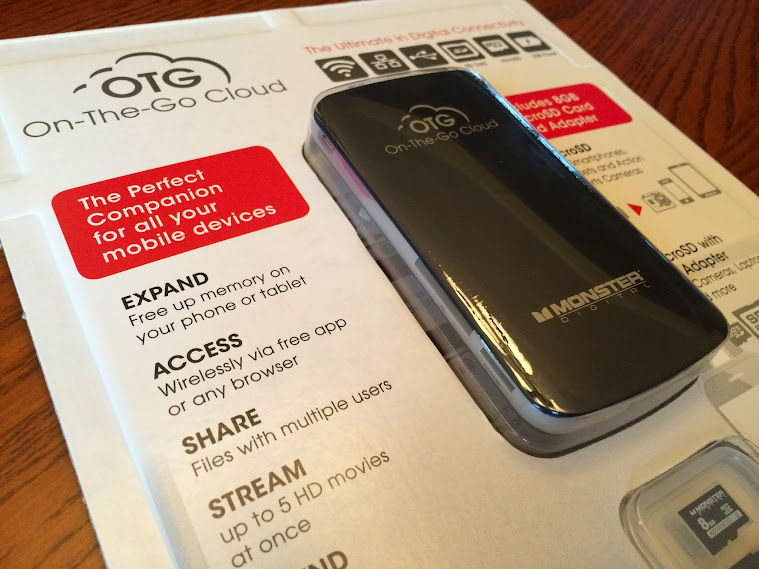 As a reminder, I paid $14 for the Monster Digital OTG Cloud. At that price, if I only used it as a battery charger, it was worth the price. With the addition of only the USB cable and 8Gb microSD, It paid for itself twice over. Add the network server, portable Wi-Fi router and Wi-Fi extender features and I snagged an incredible deal. Would I pay the $99 MSRP for the device. No way! While the hardware appears top notch, there are way too many issues with the fit and finish of the firmware for me to recommend at that price. What about the going rate at Amazon of $30? That’s a tough call. $30 is close to the cost of a backup battery, USB cable and 8Gb SD card. Maybe? I guess it depends on if you know what you are getting and whether you can get any value from the software features. If you need a travel Wi-Fi router, this is probably about the cheapest you can find. It’s not great, but it just may suffice in a pinch. As a file server, again, its just barely usable. It might be a good way to take video with you on trips and/or to watch while traveling. This device will ultimately die as a viable product for the masses with its current software. It is too difficult to configure and operate. If Monster were to spend some developmental time to code real firmware and improve the user interface this could be a very interesting and useful device. As is, and with no current development, it is what is and it’s not good doing what it is. Geeks like me can probably squeeze some value out of the device at $14-30. The average Joe should pass this one by.